“How deep the peace, the confidence, of those whose wrongs are forgiven. This short response is based on Psalm 32. It was written by Linnea Good in 2004. 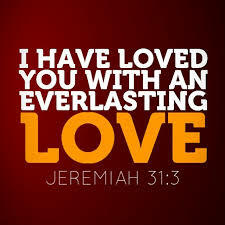 “God has loved with everlasting love! We are the children of the One who draws us to His side. God has saved us by His grace. Our faith is sure in God’s embrace. Rejoice, lift up your voice and sing to the King! This week’s anthem explores our relationship with God and God’s love for us. The words and music are by Lloyd Larson (2014). The lyrics are based on Jeremiah 31:3 and Romans 8:38-39. Larson also incorporates one verse of Albert L Peace and George Mathson’s hymn “O Love That Wilt Not Let Me Go” (1884). The anthem was dedicated in memory of Ken Hodgson in 2015. Wonderful love, wonderful love dwells in the heart of the Father above. Seeking the lost, seeking the lost, saving, redeeming at measureless cost. Jesus is seeking the wanderers yet; Why do they roam? Why do they roam? Love only waits to forgive and forget; home, weary wanderers, home! This hymn was written by Robert Walmsley, a jeweler in Manchester and a Congregationalist leader of the Manchester Sunday School Union, in 1900. Adam Watson’s WONDERFUL LOVE is the tune known to Canadian congregations for Robert Walmsley’s text. The hymn leads us from the eternal love of God for us, through the coming of Jesus, who tells of us God’s love and searches for the lost, to the yearning for God’s continuing love. What do you think you deserve from others and from God? Posted in Notes on the Notes on March 30, 2019.